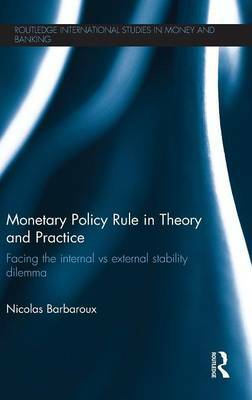 This new volume sheds new light on current monetary issues, in particular the debate on monetary policy making, by blending theoretical economic analysis, history of economics, and historical case studies. A discretionary monetary policy refers to cases in which the central bank is free to change its policy actions or key instruments when the need arises, whilst a monetary policy rule can be defined as a commitment from (independent) central banks to reach one or several objective(s) by way of systematic policy actions. This book uses case studies from France and Sweden, and places them in the context of Keynes' argument from his 1923 `Tract on Monetary Reforms', to support the argument that the use of discretionary practices within a monetary policy rule (such as in the Gold Standard era) is the best approach. This book takes an innovative approach in combining a theoretical analysis (mainly the work of New Neoclassical Synthesis throughout Woodford's model) a history of economic thought analysis (based on the monetary works from Wicksell, Cassel and Keynes) and an historical study of central bank practices both in France (based on Bank of France archives materials) and in Sweden. The final section of the book explores the debate on monetary policy rule in light of the 2008 financial crisis. As such, the book provides a unique synthesis that will be of interest not only to scholars of history of economic thought and economic theory, but also to anyone with an interest in monetary economics and contemporary monetary policy.